Today the Chinese New Year begins. It is the year of the dog. Being a dog lover, I had to make a dog page for Art Journal Journey and Rike's challenge Animals A-Z. You can see my page really has nothing else to do with the Chinese New Year. You can see the spiral on the right because this is next week's page in my calendar journal. I began by coloring the background page-as my calendar is a coloring calendar. Then I added the tissue over part of the page, as well as the 3 pups. I finally stamped the circles with yellow paint and then outlined them with a Stabilo pencil. Then I added my tag and the 3 gradually increasing sizedd dogs. And here's a close up of the tag. It may not be the fanciest tag I've ever made, but it is a tag with a quote, so I am also linking up to Tag Tuesday. And it is almost the weekend! This is just SUPER - the tag itself is amazing and it goes so well with the page - Gorgeous! Happy start of the weekend Erika!I hope it well be a realxing and nice one for you! Thank you so much for a fabulous page linked to Rike's theme! Your page is beautiful - you used pretty colors for this coloring page, and to add the tissue was a great idea! These circles fascinate me - I cannot look away, they are outstanding! The tag and the dogs complete this wonderful page! 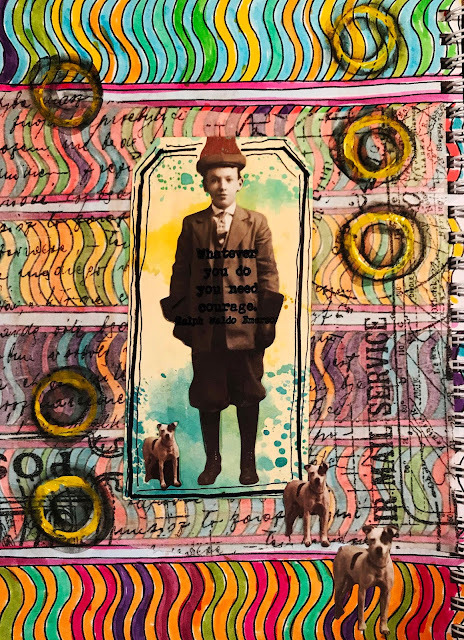 Thank you so much for joining us again at Art Journal Journey today! Happy Dog Days of the New Year! I love the colors and layers in your new tag. It's just fun. The brights are so very bright and the boy and dogs a perfect contrast. I wish you could stay in bed loner too. When I worked it was SO HARD to get out of bed every day and get to work on time. In fact, I made flex arrangements to come in late and either work late or take short lunch. Now I find myself up WAY before I ever got up before. I think it's because I gave up stress when I retired and now I actually sleep! Stay safe out there. Oh yes, and thanks for joining us at Tag Tuesday! Colorful page. The cute pupper reminds me of Petey from The Little Rascals. Hopefully, you'll be able to relax a bit with the long weekend. You do get President's Day off, yes? Next week, will also be February school vacation week for a lot of schools here. Do you get the week off too? Have a great weekend. Happy (Chinese) New Year to you, Erika, and being able to sleep-in on a rainy Friday (or any rainy day) is indeed wonderful. You must have used every dog in your TH doll arsenal for this post, Erika. 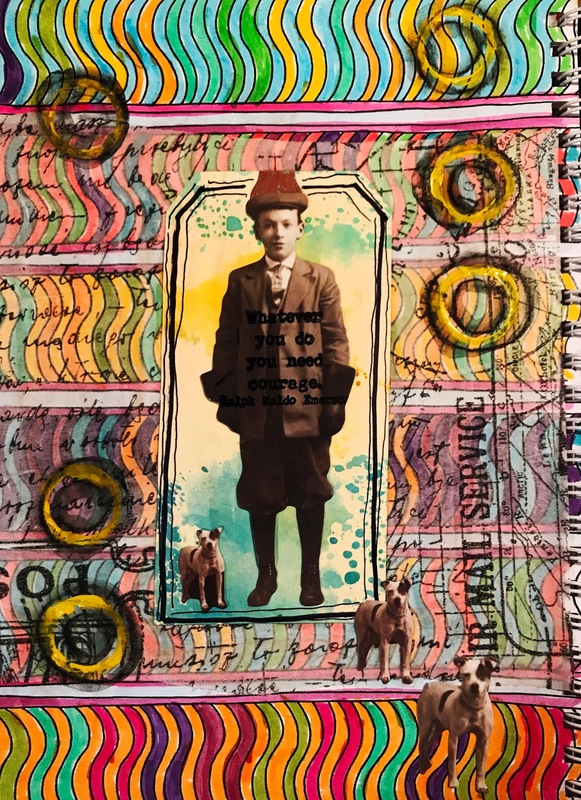 It's a fabulous page and great for sharing with us at Art Journal Journey. I can't believe the colors you have chosen for the background. They really WOKE ME UP this morning. It is a fabulous entry!!! Happy CNY, too. What a great tag!!! 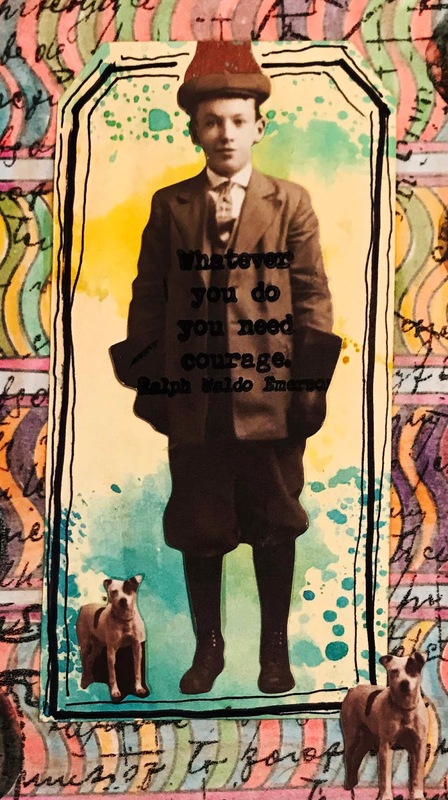 I love the quote, the boy and dogs and all the lovely colors! I love your colourful patterned page. Its a wonderful tag and quote as well. and the three different sized dogs look great. I hope you have a restful weekend after your busy week. This brought a happy smile to my face, such a great colourful page and lovely use of those dog images. Great idea also to link it to the year of the dog, even though the page itself has nothing to do with the Chinese New Year, it still honours it somehow... Happy weekend! I love those bright & colourful stripes, and that wonderful tag and quote. Altogether a great page! A fabulous colourful page incorporating the tag with the boy and his dog, and it's a great quote.